Can you believe we are already 3 weeks into February? This month is really flying by! It's week three so that means it's time for the challenge! This is our favorite part! We love to see the fun things that you create!! Just in case you need to catch up, the links for week one and week two videos are below! Don't forget to ask the place you purchased your kit about the due date of your project! 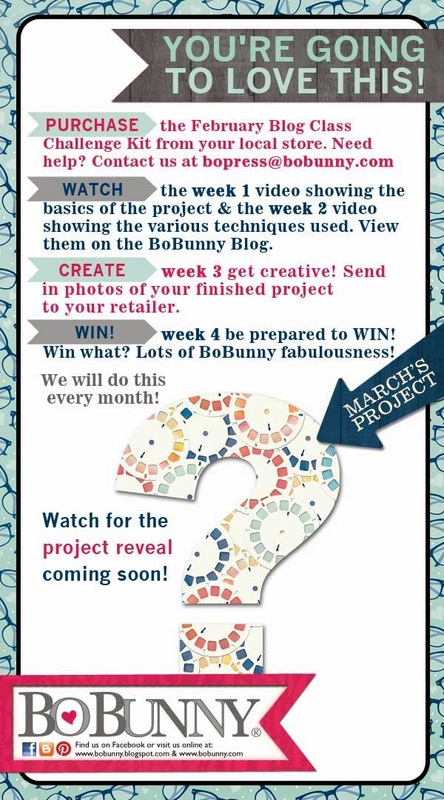 You want to be sure that your entry is submitted so that you can be entered to win a $150 BoBunny Prize! Good Luck! If you have any questions email us at bopress@bobunny.com! The March Blog Class Challenge project was a huge hit at CHA this year. If you are thinking about playing along, March is the month to start!! Can you guess which collection we are going to be using? ?